JVC introduces two new camcorders that support graphics overlay. London, September 2016: Introduced at this year's IBC show are two new camcorder models, based on the GY-HM200 4K live streaming camcorder. These are the GY-HM200SP sports camera and the GY-HM200BC broadcast and events camera. What’s unique about these cameras is their ability to support graphics overlay in both the live SDI and HDMI video output and the live stream. There’s a requirement in a range of sporting environments to be able to display scoring information and the GY-HM200SP allows you to do all of this with just one camera and no additional hardware. The GY-HM200SP produces a real-time score overlay on recorded and streamed HD video for a variety of popular sporting events, including football, basketball, soccer, volleyball, hockey and more. 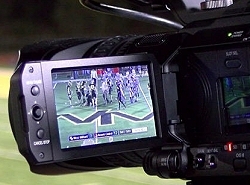 The overlay is produced for both the streamed and recorded video simultaneously. There are a number of generic templates for some sports in the camera and updating of score data is incredibly simple via a smart phone. The GY-HM200BC uses the same principle as the SP version, but enables you to update the lower third graphic along with the channel logo, which is very important for copyrighting and content protection. It’s ideally suited to internet TV news, bloggers and live event companies, or perhaps to any corporate institution or educational establishment who want their media included with channel identification.